The above info came from Morgan, and was edited by yours truly (contact me). The image came from animeyume.com. Ginkotsu is human but is also part machine thanks to Renkotsu. He is defeated by InuYasha and is later killed. Bankotsu takes his and the rest of the Band of Seven's jewel shards. 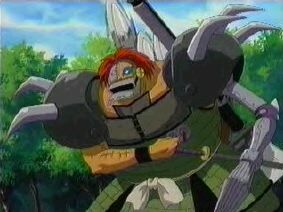 After the jewel shards are taken out of Bankotsu's body, he is killed by his banryu. The above description came from Morgan, and was edited by yours truly (contact me).